Our reviewer finds a lot that's notable about the diner – in particular, its delectable corned beef hash. 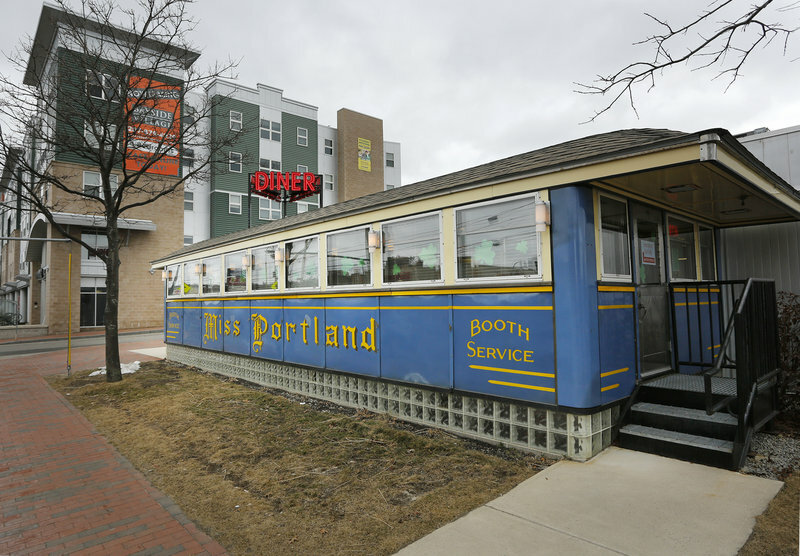 PORTLAND – I was drawn to the Miss Portland Diner recently because I wanted to see the restored 1949 dining car in all its chrome and tile splendor. And I wasn’t disappointed. But I think what will draw me back there — and soon — is the amazing homemade corned beef hash. While a lot of places advertise homemade hash, the stuff at Miss Portland Diner passes every eye and tongue test where others might not. First, the shreds of corned beef are big, tender and meaty, not finely minced or ground to a pulp. There are carrots, celery and onions that have obviously been chopped by hand. And it was not burned or overcooked. It tasted as fresh as if it had been someone’s St. Patrick’s Day dinner the day before. Because St. Patrick’s Day is coming right up, I opted to have my hash as part of Miss Portland Diner’s Irish Benedict ($8.95). I got two fluffy English muffins topped with huge mounds of the hash, two light and airy poached eggs, and tangy hollandaise sauce. Plus home fries. The hash stood up to — and was complemented by — the hollandaise. The poached eggs were done extremely well, with a ton of juicy yoke in each. The whole thing was great, but might be a tad rich for an everyday breakfast. The diner has an extensive all-day breakfast menu. There are standards such as two eggs with bacon, sausage, ham, kielbasa or Canadian bacon for $5.75. There are omelets of all stripes, including a Greek with spinach, tomato, feta cheese and mushroom for $8.75, and a Parisian with ham, asparagus, mushroom and Swiss cheese, also for $8.75. Breakfast specialities include hash with two eggs ($8.95), steak and two eggs ($9.25) and a Florentine Benedict with sauteed spinach and grilled tomato ($8.75). The menu also included various kinds of French toast, pancakes and a Belgian waffle with fruit. There are breakfast sandwiches of all kinds, including one called the “MPD Blue” which features egg, sausage, a blueberry pancake and maple syrup on an English muffin for $5.50. It’s breakfast for people who can’t decide what to have and need it to go. The menu also has lots of lunch and dinner items, from salads, burgers and dogs to wraps and seafood. There are some things I think of as classic diner fare, such as an open-faced turkey sandwich with gravy for $7.50 and a fried haddock sandwich for $8.25. There’s an entire “comfort foods” section, which includes chicken pot pie ($9.50), macaroni and cheese ($7.95) and pot roast dinner ($9.75). But just as enticing as the food at Miss Portland diner is the diner itself, inside and out. If you’re a fan of architecture, of history or of diners, you’ve got to see it. 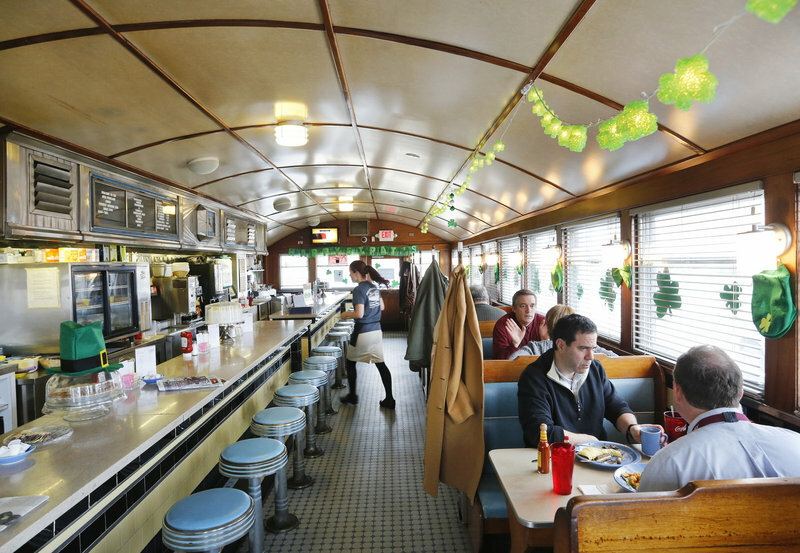 It’s a classic dining car built by the famed Worcester Lunch Car Co., which turned out lots of easy-to-move diners. It’s in its third Portland location, having been moved and renovated around 2008. The blue and yellow lunch car sits on glass blocks, with the words “Booth Service” inscribed low on the car. The original diner allows people to sit in wooden booths or on cool swiveling stools along the long counter. A new dining room was added in the back during the renovation. The inside of the original diner is just gorgeous — speaking as a diner fan here — with a curved dining car ceiling, wood along the walls and booths, tiles along the counters and on the floor, and lots of chrome behind the counter. There’s even a Worcester clock on the wall. But don’t look too closely at it. In a setting like the one at Miss Portland Diner, you should take your time and enjoy the moment.